The Red Nation formed in November 2014 out of a desire to contribute to the widespread resurgence of strong, vocal, organized and radical Indigenous struggle in Albuquerque and beyond. 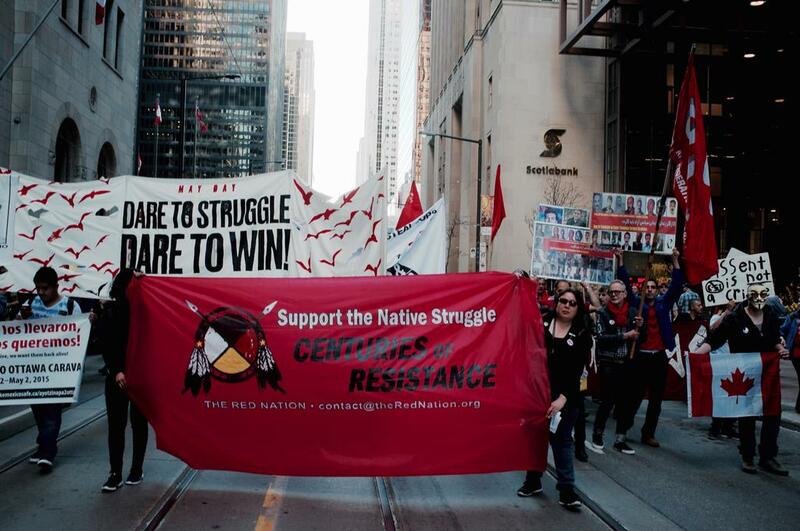 We formed to address the marginalization and invisibility of Indigenous struggles within mainstream social justice organizing, and to speak out and strategically fight against the ongoing destruction of Indigenous life and land. From the disproportionate violence that Indigenous people experience from citizens and cops here in Albuquerque, to the ongoing theft of Indigenous water rights by big cities and corporations through so-called “legal settlements” that will ensure we are no longer able to live in our own homelands, to the horrifying impact of nuclear and uranium development in Indigenous communities, it is clear that Indigenous people must fight simply to survive. The Red Nation stands with all Indigenous people and their accomplices in the defense of land and livelihood against this violence and, with you, reclaims Albuquerque as an Indigenous space. We are a council of Indigenous and non-Indigenous activists, concerned community members, students, organizers, revolutionaries, intellectuals, educators, and long time members of the Indigenous struggle who are dedicated to building a widespread movement to help with the liberation of Indigenous peoples from colonialism. We do this through centering Indigenous agendas, people and struggles; working with allies to form coalitions to successfully engage in these struggles; and by collectively working to smash colonialism and its violence against Native people in all structural and material forms. We continue a long and unfinished history of Indigenous resistance by starting in our own backyard, reviving an Indigenous-led movement here in Albuquerque that has been dormant for far too long. It has been forty years and many Indigenous lives lost since an organized, Indigenous-led force of this kind has existed in Albuquerque. It is time to stand up again, and take steps together, to demand the end to a fundamentally oppressive system that affects all of us because it perpetuates violence against Indigenous life. We ask you, Albuquerque, to stand with us today and always!